A stock market is a market where company stock is traded between people who want to buy the stock and people who want to sell stock. Just the same as a fish market where people want to buy and sell fish or a cattle market where cows are exchanged between buyers and sellers. Stock is just a slice of a company/organisation, if you own over 50% of the stock then you own a company. Stock exchanges are key companies that allow the stock market to work as efficiently as it does. They list shares prices for thousands of companies, they list the bid/ask prices of shares and enable quick electronic transfers of shares between people. Some stock exchanges you might have heard of include NASDAQ, LSE (London stock exchange) and the NYSE (New York stock exchange). Companies Companies are vital for a stock market to work! A company must be listed as a PLC (public listed company) for people to trade it’s shares at a stock market. To be listed as a PLC a company must meet strict financial requirements. 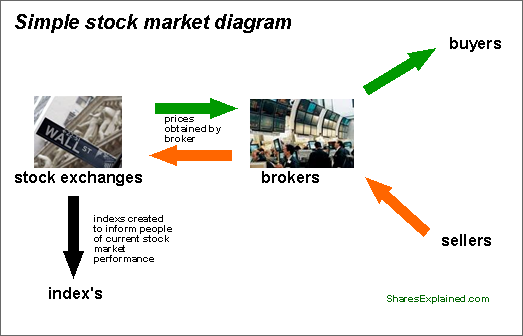 Brokers are the middle men between the stock exchange and the stock buyer (i.e. you). They fetch the buy and sell prices of stocks from the stock exchange and relay them to the purchasers. It is a legal requirement that you open a brokerage account to buy or sell stocks. Without people who trade stock (buyers and sellers) a stock market would not work. Buyers can range individuals sitting at home on their PC to huge multi million dollar investment funds. Find out why people buy and sell shares. Heard of the FTSE 100, the Dow Jones 30 or the S&P 500? Well these are just indicators. Take the S&P 500 for example, it measures the top 500 companies in the US. If most people are selling shares in these companies then the S&P 500 will point down and vice versa. Nothing to complicated! More on index’s. There are several entities that surround the stock market but the components above are the main things that formulate a stock market. Did that interest you? If so try some of the articles below. Why not have a go playing stock market 60 (a quick free game on our website that will help you get to grips with the stock market!). Find out more about shares.